An identifierPair element contains data on one group, repeat for more groups. For each <IdentifierPair in the request you will get a status in the <statusinfoSet><status> in the response. The order of the <statusInfoset><status> corresponds to the the order of the <IdentifierPair> in the request. 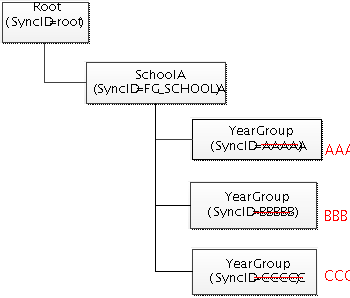 In the example below, the third <IdentifierPair> fails because the syncID in<IdentifierPair><SecondId> already exists in itslearning,.